If you try typing the word ‘bagpipe’ in Google Images, you might be forgiven for assuming the bagpipe world extends little beyond Scotland. Out of the first fifty images, only two show non-Highland bagpipes. This is indeed a culturally interesting detail, since there are hundreds of different kinds of bagpipe in the world — from India to Britain, and from Libya to Sweden. And yet in Scotland the instrument has become a national symbol of immense importance. The very word ‘bagpipe’ oozes Scottishness — as the word Scotland does bagpipes. It is interesting that Brown should imagine — or tease his readers into thinking — that none other than the devil himself should have a personal piper — not playing just any music, but ‘Scotch tunes’. It is fascinating the way Blow presents the bagpipe as the lowest step in the hierarchy of musical instruments, and how it is charged with negative religious connotations: the bagpipes represent the most corrupt version of Catholicism; as seen by the ‘Fanaticks’. Contemporary politics, religion and culture had outlawed the bagpipes, and pushed them to the fringe. And Popish Bagpipes make a hideous Noise? Amidst such Fa-la-la, and Toot-a-Toot? The bagpipes and their music are turned into a pretext to claim the supremacy of one faith over the other. The Anglican faith shares, in the view of the dissenting husband, the traits attributed to Roman Catholicism — and therefore to Jacobites also, since the Jacobites followed the Stuart dynasty: a Catholic monarchy. The husband responds harshly to his wife’s opinions on the church and bagpipe music: such a ‘Babylonian Noise’ and ‘Jargon Sound’ is not fit for Church, but rather her ‘Heathen Bag pipes’ should be of use in ‘Smithfield6 Booth, or Wapping Musick-house’. He calls them ‘filthy’, ‘odious’, ‘noisy Pipes, that do in Brothels stand’; it is a ‘great Abuse’ to use ‘those wicked Instruments’, as their ‘Whistles roar aloud in Fairs and Brothels’: the pipes are used in ‘ill Houses’, and ‘Moorfields Bawdy-houses.’7 These comments are of no small sociological consequence. It would be extremely difficult to find a similar assertion in the works of a Scottish author; even if the bagpipes are also seen in Scotland as an instrument for accompanying merriment. The vilifying role of ‘Whistles’ is particularly worthy of note. Since Medieval times whistling was considered morally inappropriate, especially for women; it is in fact a popular saying that ‘A whistling maid and a crowing hen are neither fit for God nor men.’ Ward’s description is suggestive of the bagpipe being unsuitable for receiving the word of God: that its sound should be equalled to a whistle is no coincidence. The ‘ungodliness’ of the instrument is not a trait attributed to Scottish bagpipes alone, as also elsewhere in Europe the bagpipe could (and still can) be seen portrayed — and even built — with Luciferian characteristics, i.e. in the shape of a goat. The goat is one of the possible representations of the devil, and since goat’s skin is one of the most frequently employed materials for the bag of the instrument, the connection is easily made. The bagpipes seem to incarnate the defects of the Catholic faith — or rather, they appear to be the perfect means to portray them; their symbolism and characteristics are used by both sides to attack the other. The dissenting husband explodes in a strong expression: ‘I’d rather hear the Tower Lyons roar; I tell thee they’re the Bag-pipes of the Whore.’8 The ‘Lyons’ Ward refers to the ones which used to be kept in the Tower of London, and which became a symbol of the Crown: the authority of Protestant succession, and as such the emblem of the opposition with the Whore of Babylon — the Roman Catholic faith. The husband shows all his wrath and disgust towards music, and particularly towards bagpipes. It is as if the bagpipe were in itself an evil, corrupt instrument, much in the same way as the flute in the song ‘The Old Orange Flute’, which would keep playing the tune ‘The Protestant Boys’ even as it burned in front of the Catholic priests who ordered its destruction.9 ‘I tell thee they’re the Bag-pipes of the Whore’ is a strong statement which unquestionably links the bagpipes to the Catholic faith. You Witch of Endor, nay, you Jacobite? To the dissenter’s eyes, bagpipes are evil to the extent of being anti-Christian. The essence of all evil is enshrined in the symbol of the bagpipes and their apparatus of signifiers. The dialogue ends with the husband leaving for his own business, and letting the question drop unsolved. An alternative interpretation of the symbolic meaning and value of the bagpipe cannot be altogether ruled out: the word ‘bagpipe’ may in fact have been used by the two authors as a derogatory term to identify the organ, whose constitutive elements do include a form of bag — the bellows — and pipes. Purcell and Blow of Brown’s work were organists; and playing the organ in church is to this day a Catholic tradition; while it is difficult to find references to bagpipes being played during services in church. Ned Ward refers to bagpipes being played in brothels: in his opinion, ‘noisy Pipes, that do in Brothels stand’ have ‘profan’d’ the Church. The sexual allegory of these references is unmistakable, though one cannot exclude the possibility that the author is hinting at the use of organs, or also portative organs, which could be transported easily — in brothels, churches, or fairs, as Ward suggests. A portative organ was on many occasions, such as mass, processions or private entertainment, a possible alternative to the better-known church organ (or ‘kist o’ whistles’, as it was also known in Scotland,11 whence possibly the reference to the ‘vile unhallow’d Whistles’). Church organs are also known to have ‘found their way’ to taverns and music houses during the Commonwealth,12 which may have appeared deplorable to Ward’s angry Low-Church husband. Whether Brown and Ward were actually referring to bagpipes all along, or whether the term was being employed as a derogatory ‘synonym’ for the organ, the connection with the Roman Catholic faith is in either case confirmed: the bagpipe appears to be the perfect icon to represent popery, and corrupt Catholicism. The devil-and-bagpipes dichotomy was very much a popular theme when describing Scotland even in the late eighteenth century. 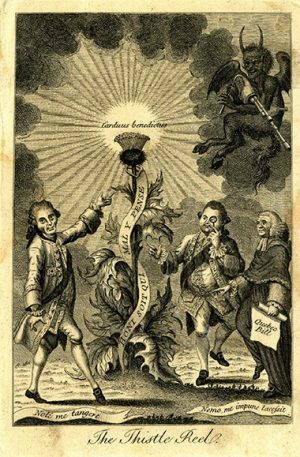 ‘The thistle reel’ is a fascinating engraving published in The London Magazine in February 1775 (with a dissertation on the theme, called ‘The thistle reel: a Vision’).13 It depicts Lords Bute, North and Mansfield dancing around a thistle in the shape of a Holy Chalice. The thistle bears a garter with the motto honi soit qui mal y pense, and in the top right-hand corner a devil plays a set of bellows-blown bagpipes. The print satirises the Scottish influence on the Quebec Bill. 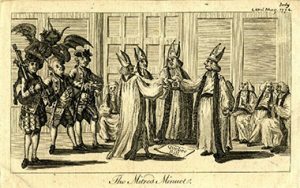 The Quebec Act of 1774 guaranteed French law code, religion and status in the Canadian region. The smiling devil playing for the noblemen evidently represents the legitimisation of immorality. The bagpipe, well-established emblem of Scottishness, is handled by no less than the master of all evil; it is as if the sound of the pipes, the echo of Scotland, dominated the situation making the Lords dance — commit evil deeds. Four bishops cross hands over a copy of the Bill, while three ministers witness the scene. Lord Bute, in Highland attire, is playing a set of bellows-blown bagpipes — or at least no mouthpiece is discernible. Hovering over the ministers is, yet again, the devil. It should not surprise us to see that the bagpipes featuring in these prints have very little to do with the Scottish (Highland) bagpipe as we know it today. To start with, it is only recently that stricter categorisations on ethnic or national lines have been applied to British bagpipes. In the past, classifications and varieties were much more flexible, and indeed the characteristics of each instrument were variable. Secondly, and perhaps more importantly, many English printers did not necessarily have in mind a specific model of a Scottish piper for their depictions. Artists often took their models from Dutch representations of pipers, or from the model of the musette de cour, the bellows-inflated bagpipe which became very fashionable in France during the seventeenth century. The accuracy of the representation, ultimately, was not so important: essentially all it took was for a bagpipe of any form to be present on the page to convey an idea of Scottishness. What emerges from both these images — which are but two of a number of examples! — is the underlying message that the tendency towards malevolence is an integral part of the national behaviour. Whether the devil plays the bagpipe to induce the Lords to dance, or whether he witnesses the scene as the bagpipe is being played, the instrument contributes in creating a bond between Scotland, religion and politics. The bagpipe’s sound provides the background music for all things unlawful, corrupt and unacceptable. Its connection with Scotland, in the eyes of many an English satirist, is so strong that its mere presence in literature or prints is enough to convey a plethora of signifiers which speak of Jacobitism, devotion to the Stuart dynasty and a Catholic monarchy, and the disruptive effects this would have on the English Establishment. The fascination for the satanic association with the bagpipe is still present to this day, although its connection with Scotland has weakened enormously. Already by the end of the eighteenth century it is almost impossible to find English works in which the bagpipe is portrayed quite in the same way as it was by Ward or Brown. As the threat of the Jacobite rebellions was seen to fade, and Scotland was no longer seen as an enemy, the terms and imagery employed to describe the bagpipe took up softer terms. The bagpipe’s presence in literature and art did not stop altogether evoking feelings of disquietude: its implications in war and conflicts remained discernible well into the nineteenth century. In William Wordsworth’s pastoral poem ‘Michael’, the South wind is described as making ‘subterraneous music, like the noise / Of bagpipers on distant Highland hills’.17 The sound-quality of the rumble of distant Highland bagpipes in the background, especially its menacing implications of battle and upheaval, is compared with the stormy threat of a south wind, the warmth of which proverbially brings tempest. The sound of the bagpipe is threatening and disquieting; it feels like something unavoidable, irrepressible; almost sublime. The icon-bagpipe is so heavily charged that it is not merely pastoral and rustic. It is a disturbing presence, which reminds the reader that even the rural haven of the Northumbrian countryside of the poem is not free from melancholy, disquietude, and mortality. In Childe Harold’s Pilgrimage Lord Byron wrote about the battle of Quatre Bras (1815), and how the ‘pibroch thrills, / Savage and shrill’ sounded ‘in the noon of Night’, instilling ‘The stirring Memory of a thousand years, / And Evan’s — Donald’s fame rings in each Clansman’s ears!’18 ‘Evan’ and his successor ‘Donald’ are the Camerons of Lochiel: Evan fought in the 1715 rebellion, and Donald followed Prince Charles to France after Culloden. The Jacobite rebellions are ever-present in the author’s mind. The same battle was described by William Makepeace Thackeray in Vanity Fair: the ‘shrill pipes of the Scotch’19 awakened Brussels, and Jos Sedley snoozed ‘in spite of all the drums, bugles, and bagpipes of the British Army.’20 In the latter instance we can see how the bagpipes are now quite comfortably termed ‘of the British Army’ (my italics) — they are no longer the ‘bagpipes of the Whore’. Instead, they are the instrument which marks the proud presence of the British Army in battle. The sound of the bagpipe enshrines ideas of a long-lost past of war, conflict, rebellion against the Establishment. But as these later passages illustrate, the derogatory terms have subsided to make room for a kind of discourse which tickles the reader’s imagination with the memory of Jacobitism, but which is altogether free from its burdensome historicity. Jacobitism is part of a dangerous past which is no more: it is a concept, which speaks of loyalty to a lost cause, attachment to ancient values and traditions, and martial valour. It has become a world sufficiently distant to be re-evoked, re-shaped and revisited in an exotic form of novel-like imagination. The sound of the bagpipe can now safely be listened to and enjoyed, precisely for the ideals and values it has come to embody. Many thanks to Hugh Cheape for his suggestions. 1 Eric Blom, George Grove and Denis Stevens eds., Grove’s Dictionary of Music and Musicians, (St. Martin’s Press, 2001), s.v. ‘Staggins, Nicholas.’. 2 Thomas Brown, ‘Letters from the dead to the living, and from the Living to the Dead, both Serious and Comical’, in The Works of Thomas Brown, fifth edition (Printed for Sam Briscoe, 1719), vol. 2, p. 298. 3 Brown, The Works of Thomas Brown, p. 300. 4 Howard William Troyer, Ned Ward of Grub Street (Frank and Cass Company Limited, 1968), pp. 3-5. 5 Edward Ward, Nuptial Dialogues and Debates: or, an Useful Prospect of the Felicities and Discomforts of a Married Life, in two volumes (printed for C. Hitch et al., 1759) vol. 2, p. 199. 6 Smithfield is a locality in London, where cattle and other livestock were sold. Ref. The Oxford English Dictionary, prepared by John A. Simpson and Edmund S. C. Weiner (Clarendon Press, 1991), s.v. ‘Smithfield’. 7 Ward, Nuptial Dialogues, vol. 2, pp. 202-204. 8 Ward, Nuptial Dialogues, vol. 2, p. 204. 9 See Matthew John Caldwell Hogart, The Faber Book of Ballads (Faber & Faber, 1965), pp. 216-217. 10 Ward, Nuptial Dialogues, vol. 2, pp. 206-207. 12 Geoffrey Cox, Organ Music in Restoration England (Garland, 1989), vol. 1, pp. 16-17. 13 The London Magazine, or Gentleman’s monthly Intelligencer, vol. XLIV (London: Printed for R. Baldwin, February 1775), p. 56. 15 Andrew Laing, ed. The Poems and Songs of Robert Burns, (Methuen & Co. Ltd., 1926), p. 441. 16 Francis Grose, A Classical Dictionary of the Vulgar Tongue (Printed for S. Hooper, 1785), s.v. ‘bagpipe, to bagpipe’. 17 Thomas Hutchinson, ed. Wordsworth Poetical Works, (London: Oxford University Press, 1971), p. 104. 18 Paul Elmer More, ed. The Complete Poetical Works of Byron, (Houghton Mifflin Company, 1933), p. 39. 19 William Makepeace Thackeray, Vanity Fair (London: Oxford University Press, 186? ), p. 360. 20 Thackeray, Vanity Fair, p. 370.